The Government of Japan provided 3,078 million Japanese Yen (approximately 3.1 billion Rupees) towards the construction of the Gampola-Nuwara Eliya, Gampola-Nawalapitiya roads and the Ramboda tunnel under its ODA (Official Development Assistance) Loan scheme. The construction work was completed last year and the Ramboda tunnel was opened yesterday. The project named "Road Network Improvement Project" focused on the improvement of 54 km long Gampola-Nuwara Eliya road and 17 km long Gampola-Nawalapitiya road which classified as (B13) and (A5) respectively in the Central Province in Sri Lanka. The Ramboda tunnel which has been constructed preserving the scenic value of the surrounding environment is an alternative to the Ramboda Pass. This 225 meter long tunnel is now the longest one in Sri Lanka. The rehabilitation of these roads will facilitate easy access and faster mobility of neighbourhood people to working places, schools and hospitals in the central areas of the country. This new road network will contribute to improve commercial activities and social mobility thereby upgrading the living standards and economic development in the region. The Government of Japan has been supporting the implementation of the projects which range from grass roots to large infrastructure level throughout Sri Lanka to benefit all communities for over 50 years. The aim of all the support is to alleviate poverty and to facilitate self-help initiatives among the people of Sri Lanka in order to achieve sustainable development. 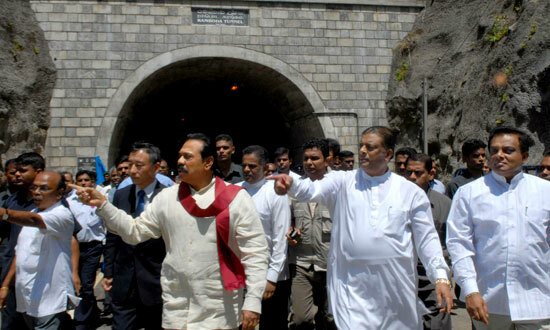 President Mahinda Rajapaksa, Jeyaraj Fernandopulle, Minister of Highways and Road Development and Kiyoshi Araki, Ambassador of Japan were present at the opening ceremony of the Ramboda Tunnel with other government officials and local community representatives.